Nearly 50 years after her father Luce disappeared, the mystery of his death still haunts Jane Weld. The general assumption is that Luce was murdered by the jealous and violent husband of Ada Varick, Luce’s lover. Still, nobody knows for sure and nobody was ever charged in Luce’s death. Jane is getting older and what she really wants is answers. As luck would have it, Jane has a long-standing Friday game of Scrabble with Ada and she is increasingly pushing for answers, particularly as her daughter Marne enters into a relationship with one of Ada’s younger sons. 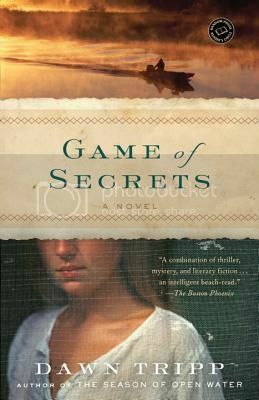 Game of Secrets is billed as parts literary mystery, thriller, and love story. The literary part was the only one that had any resonance with me, however. I did not feel at all invested in either Marne’s love story or the mystery of Luce’s death. Tripp’s focus seems to be on her writing, which is lovely, but I felt that it came at the expense of both character and plot development – Marne in particular was hard to empathize with, even though more f the story is told from her point of view than from anyone else’s. I simply didn’t find anything about Game of Secrets particularly intriguing, or really even interesting. Many reviewers really enjoyed Game of Secrets, but I was not one of them, and cannot really recommend it. For me it was one of those books that I didn’t mind reading, thought it was worth my time but it didn’t thrill me and now I have trouble remembering both it’s name and plot. I did like the scrabble aspect because I used to play with my grandmother but if that is all I remember from the book, I will have to agree with your assessment. I wasn’t sure what I thought of this one, so I think I’ll pass on it all together. I think I’ll pass on this one too. Even the premise didn’t grab me.